It has been interesting as a book review blogger to see what books you gravitate towards in posting a review. I have noticed in the couple of years of doing these reviews that you choose some books and some books choose you. 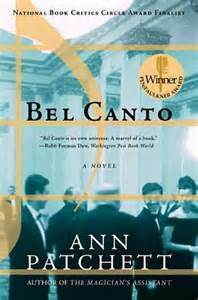 That was the scenario for Bel Canto by Ann Patchett. I heard her interviewed on the Book Lust podcast last year and the host was asking Ms. Patchett questions about her latest novel, State of Wonder, when the host mentioned to the author that Bel Canto was one of her favorite novels. The host’s genuine enthusiasm about Bel Canto changed the entire interview and I sensed that Ms. Patchett appreciated her passion for that novel. I knew I would read and review Bel Canto after that interview. Bel Canto was loosely based on the Lima Hostage Crisis of December 1996. Where members of a revolutionary guerrilla movement took hostage of high-level diplomats, government and military officials, and business executives who were attending a party at the official residence of Japan’s ambassador to Peru, Morihisa Aoki, in celebration of Emperor Akihito’s 63rd birthday. Ms. Patchett’s version left the country unnamed and the birthday party was for a wealthy businessman, Mr. Hosokawa. The home belonged to the vice president of this unnamed South American country and the hook of the novel revolved around Roxanne Coss, opera’s most revered soprano who performed at birthday party per request by Mr. Hosokawa. The businessman loved opera and the only reason he would have came to this unnamed country because his favorite opera singer was performing at the party. The guerrilla fighters took hostage of the residence because they thought the president of the unnamed country would be attendance for the birthday party. And if they could have taken the president as a hostage, all of their demands for freedom and overthrowing the government would be realized. However, the president did not attend the birthday party and they decided to keep everyone else as hostages. The strength of Bel Canto was the characters and their interaction with each other under this extreme situation. Patchett created a colorful, multicultural cast of characters (Russians, Italians, Americans, Japanese, Swedes, & Germans) that grabbed my attention and made it a fascinating read. Roxanne Coss was definitely a “diva” in a stereotypical sense but after an incident early in their captivity, she began to reveal a warmth to her personalty that belied her ‘world renowed opera singer’ persona. Mr. Hosowoka grew as well and learned the meaning of love in an entire new way. Even of the some guerrilla fighters showed their humanity and reading the story made you hope for a different outcome to their eventual fate. Most of all, Bel Canto was a romance novel in the best sense of that genre. It seemed that the novelist was asking the question, does love really conquer all? I would write that Patchett gave a definitive answer to that question in this story. But, I didn’t quite agree with it. That will not stop me from writing from how much I enjoyed reading Bel Canto and would recommend the novel be added to your reading piles and discussed at your book clubs. I’m pleased that Bel Canto chose me to read and review this fascinating story of crisis, opera, and ultimately of love and romance.